What Are the Benefits of Aloe Vera Pills? The aloe vera plant is a perennial succulent that grows mostly in tropical and subtropical climates. Its thick, spiky leaves are broken off to release a clear gel that's commonly used to treat and heal various skin conditions, including burns, rashes and wounds. Though it's often applied topically, the gel produced by the aloe vera plant can also be made into pill form. 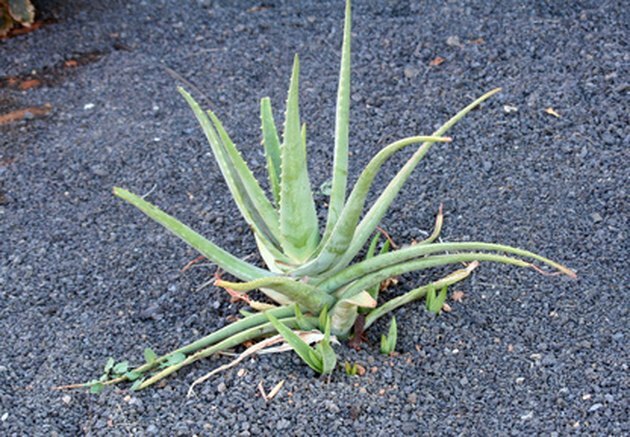 When taken orally, aloe vera may treat other body ailments. As of 2010, most aloe Vvera studies were preliminary. Consult your physician before taking aloe vera in pill form and never ingest aloe vera in its raw state. Early studies show that, when ingested, aloe vera assists in lowering blood sugar levels, says the University of Maryland Medical Center. This refers to individuals who have type 2, or adult onset, diabetes. Whether taken in tablet or pill form, aloe vera may improve the functionality of the digestive system. That includes constipation and irritable bowel syndrome, or IBS, common gastrointestinal tract ailments. It does this by increasing the body's ability to absorb nutrients, according to Vitamins-Supplements.org., a website dedicated to informing users of various supplements. In addition to aiding the digestive track and lowering blood glucose levels, aloe vera may have various anti-inflammatory effects. As a result, it can be beneficial to those suffering from arthritis. It can also treat those who experience mild joint inflammation. The anti-inflammatory benefits of aloe vera supplements also target sore or stiff muscles, skin and connective tissue.